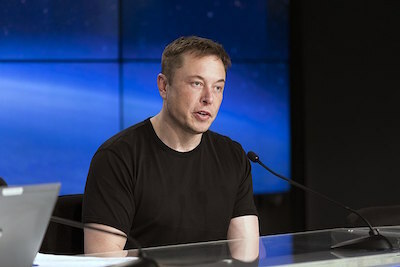 Elon Musk conducted Tesla’s Q1 investor call last week — and behaved in an arrogant manner completely unlike any typical CEO, insulting analysts and correcting his own executives. I’m all for more directness in communication, but Musk is appearing unhinged — and Tesla’s stock took a dive immediately after his bizarre performance. Quarterly analyst calls for public companies are a fundamental part of how financial markets work. Management teams present results and answer questions from financial analysts, whose job is to estimate the appropriate price for the company’s stock. Analysts have financial models predicting the company’s future revenues and profits; they ask questions intended to reveal information about the assumptions in those models. Since any secrets about the company’s business prospects are going to come out eventually, it’s generally in the company’s best interest to be as clear as possible on these calls; conversely, concealing information on a call indicates that something’s probably wrong, which is going to dent the stock price. Tesla’s business (like any startup’s) is built on hope and expectations about the future. Musk needs financial markets to believe in his dream to keep open his access to the capital. He needs the capital to make the investments necessary to keep his business afloat and growing. That’s why his unusual behavior last week was so odd — investors want him to be crazy like a fox, not crazy like a loon. Let’s take a look at the best and worst of what he said last week, from the published transcript at Seeking Alpha. The thing I’m most excited about is the rapid increase in output. We got just in the last 24 hours at the Gigafactory managed to achieve a sustained rate of over 3,000 packs per day – sorry, per week, and actually reached a peak hour with extrapolated outward would be a rate of about 5,000 cars per week. Obviously, you cannot take a peak hour and assume every hour is as good as peak, but if you can achieve it even once in an hour then with continued refinements of the system and improved operational uptime of the machinery, it means that you can achieve that sustained rate with more refinement. So, you spend essentially a month or two improving the operational uptime and the system as a whole will be able to do well over 5,000 I think. Commentary: Tesla’s ability to improve the output of its “Gigafactory” in Nevada is crucial to its plans as a company. So Musk leads with that. 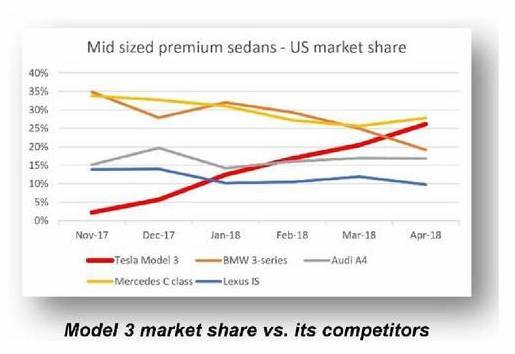 It’s worth noting the – you see a chart in the Model 3 market share versus competitors and mid-sized premium sedans. We are almost the best-selling sedan in the United States in this category as of April and we will certainly be there in May, unless something really odd – I mean, be there in May and then we’re really be there later this year. Commentary: I don’t think most people know that Tesla is outselling Lexus and BMW and closing in on Mercedes. So this is impressive. Brian A. Johnson – Barclays Capital, Inc.: If we talk about the 5,000 per week run rate, is that assuming 7/24 [operating all the time]? Or at what point do you think you get to sort of five-day two shift operation? Musk: Well, this is what I think a five-day two shift operation is a ridiculous way to operate, because that would be a very poor use of CapEx [Capital investment], nor is it the way that we have operated for most of Tesla. So the module production, cell module and battery pack production and powertrain production have always operated on a 24/7 basis. . . . I think it makes sense to operate the whole company on the same basis, but a majority of Tesla production has operated on a 24/7 basis, since we started production. . . . I do believe that the path to manufacturing efficiency is velocity; velocity and density. And that is absolutely what we’d be working on rather than just trying to spend billions of dollars on duplicating a factory. Like, if two companies are competing and one has to double its CapEx in order to double production, and the other one can, with minor CapEx, can just speed up the line by double, it’s a game over. Commentary: Musk explains his philosophy about capital investment in terms any lay person could understand. James J. Albertine – Consumer Edge Research LLC: Given the coverage that you’ve received as it relates to these high profile accidents, . . . Can you give us any color from what you’re seeing in your data as it relates to the confidence that your consumers have in the autopilot functionality, whether they’ve used it more or less frequently in their existing vehicles? Or whether they’ve opted to purchase the functionality more or less in lieu of these accidents? Because we’re really trying to get a sense of the likelihood of consumers to adopt this technology over time, so this would be very helpful. Thanks. Musk: We do see a steady increase in the number of – the percentage of miles driven using autopilot. As we roll out more functionality, as we make it better, we see a steady increase. I think . . . autopilot’s something on the order of one-third of highway miles, maybe closer – maybe a half in some cases, in some regions, are on autopilot. But then, of course, when there’s, like, negative news in the press then that dips. And then I was like, okay, this is not good because people are reading things in the press that causes them to use autopilot less. And then that makes it dangerous for our customers, and that’s not cool. That’s why I’m against that. And then we get accused of blaming the victim. I was like, what? We’re not blaming the victim here, but it is important that people not be under the wrong impression. The statistics are unequivocal that autopilot improves safety. No question. . . .
And one of the common misimpressions is that when there is, say, a serious accident on autopilot, people for some reason think that – or some of the articles think that it’s because the driver thought the car was fully autonomous and it wasn’t, and we somehow misled them into thinking it was fully autonomous. It is the opposite case. When there is a serious accident, almost always – in fact, maybe always, the case that it is an experienced user and the issue is more one of complacency. Like, they get too used to it. That tends to be more of an issue. It is not a lack of understanding of what autopilot can do. It’s actually thinking they know more about autopilot than they do, like quite a significant understanding of it. Commentary: With this answer, Musk shows he can get into detail on a challenging issue, in this case, crashes that happen on Tesla’s autopilot setting. We did go too far on the automation front and automated some pretty silly things. One example would be, we have this – this is sort of ironically foolish – we had these fiberglass mats on the top of the battery pack. They’re basically fluff. So, we tried to automate the placement and bonding of fluff to the top of the battery pack, which is ridiculous. So, we had fluffer bot, which was really an incredibly difficult machine to make work. Machines are not good at picking up pieces of fluff. Human hands are way better at doing that. And so, we had a super complicated machine using a vision system to try to put a piece of fluff on the battery pack. One of the questions I asked was, do we actually need that? So, we tested a car with and without and found out that there was no change in the noise volume in the cabin. So, we actually had a part that was unnecessary. That was forced – line kept breaking down because fluffer bot would frequently just failed to pick up the fluff while put it in, like, a random location. So that was one of the silliest things I found. Commentary: I’m not sure why Elon Musk voluntarily shared that Tesla had problems with a robot that does something that turned out to be unnecessary. Antonio M. Sacconaghi – Sanford C. Bernstein & Co. LLC. : And so where specifically will you be in terms of capital requirements? Musk: Excuse me. Next. Boring bonehead questions are not cool. Next? Joseph Spak – RBC Capital Markets LLC. : The first question is related to the Model 3 reservations, and I was just wondering if you gave us a gauge as maybe some of the impact that the news has had. Like, of the reservations that actually opened and made available to configure, can you let us know, like, what percentage have actually taken the step to configure? Musk: We’re going to go to [questions from] YouTube. Sorry. These questions are so dry. They’re killing me. Commentary: These are both legitimate questions — one about capital spending, another about whether the huge number of preorders is translating into actual orders. Musk treats the analysts like these are stupid questions. This is where he seems like an arrogant person trying to hide something. This is a very stupid thing to do. Musk: He doesn’t know much about physics. I know him. I’d be happy to engage in a physics discussion with him. I actually studied physics in college. Russell: So, yeah, my question is that just a linear improvement in your battery technology? Or is there some sort of new breakthrough or different platform that the Semi and Roadster are going to be built on? Musk: Even if we didn’t improve our battery technology at all, we could achieve a 500 mile range truck at all. We’re going to do better than 500 miles. Commentary: Implying that the CEO of Daimler doesn’t understand physics, but Musk does based on a college course, is very strange. Musk clearly understands physics — he is the CEO of rocket company SpaceX as well — but insults don’t answer the question. Musk: We’re best, which is not a class. Ahuja: Yes. We’re the best. Sorry. Musk: The best-in-class of one. Commentary: This public carping can’t do much to improve the confidence of executives like Ahuja, who are probably stretched pretty far themselves given Tesla’s challenges right now. Later, Musk apologized and explained himself in a series of tweets. To understand these, know that a “short seller” is an investor who is betting on a stock to go down. The stress from Tesla’s challenges is clearly pushing Musk to his limits. I’m sure he’s had a rough time. But treating analysts on the conference call arrogantly was a mistake, and one that caused the company’s stock to drop 10%. And finally . . . . these tweets from Saturday hardly make us believe that Elon Musk is back on track.